What do you say to the former owners of your new cat? ‘Sorry’? ‘Thank you’? ‘Goodness gracious, we have a cat’? I just settled for ‘hi’. This is a card I made to give to Tabitha’s former owners on the occasion of her signover to us. 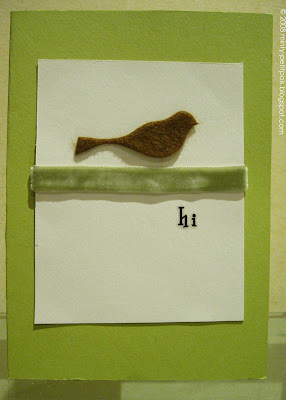 The felt bird is from Maya Road (love their stuff) and the velvet ribbon is from Stampin’ Up. Unfortunately, I placed the ribbon crooked the first time and had to redo it, so some of the flock came off. Don’t tell anyone! I stumbled across your blog from stampin when i can. Hi Julie, nice to meet you. Please have something sweet for me, too! Hi Belle! It is rather difficult coming up with a CATchy phrase that encapsulates your special manky cat relationship/event nexus. How about a "just keeping Tabs" sentiment? Or perhaps "Hope you are feline good"? Then again..."Hi" is much more natural. Thanks for sharing your modern edgy card! And concatulations on Tabitha. Ooh, Lin Mei, you are the queen of the CATchphrase! 'Just keeping Tabs' - love it. I will have to make another card with that on it (and attribute it to you, of course). CATchphrase, I love that! No attributions necessary, Belle. Hmmm...Attribution used to mean something in portfolio management to me once but now I'm happy with its common English application (oooh...there's another overloaded systems term). lin mei - I got a (work) email with the phrase "enhanced functional footprint" the other day. Urgh!